If one were to ask a stranger about classical music, they’ll likely name Mozart, Beethoven and Tchaikovsky—and maybe, if they’re really clever, Bach, too. Sadly, most people are at best lukewarm toward this “old-fashioned” style of music, sometimes branding it as “boring,” “elitist” and “the perfect ambience for putting someone to sleep.” But there is something alluring about classical music that never ceases to amaze even a slightly-more-than-casual listener like me. As I explore into the histories and biographies of the classical musicians that intrigue me, I’ve discovered that many of them are Jewish either by proud expression or by concealed ancestry. Violinist Joshua Bell once said, “There was a time when practically every major soloist was Jewish.” I cannot vouch for being Jewish and musical simultaneously, but there are indeed a significant amount of Jews not only as soloists but also composers. The numbers are as fascinating as the hefty Jewish representation in Nobel Prizes. The Jewish Virtual Library reports that even though Jews make up less than 0.2% of the global population, more than 22% of all Nobel Prize honorees are of Jewish ancestry. However, my purpose here is not to explain nor argue for this striking and curious correlation. There are plenty of scholarly books that tackle such an endeavour and I likely would be echoing their rhetoric anyway. Instead, I write this primer for those who know little about Jews in European classical music, to introduce a few eminent Jewish virtuosos who deserve an open-minded audience, and prove the genre to be less boring and tedious. It was rumored that Niccolo Paganini, the nineteenth-century rockstar violinist who’s now the author of much of the contemporary violin repertoire, made a pact with the Devil to acquire supernatural talent. Much of the Paganini legend—as well as his “legendaryness”—could use more first-hand evidence than simply hearsay. I cannot confirm Paganini’s genius any more than a historian reading about Paganini’s acclaim at the time or a violinist trying to master his complex melodies. 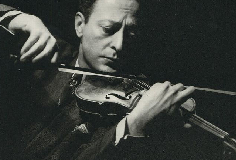 But, Jascha Heifetz might be the next best thing, or the only thing I can attest with confidence to be almost supernatural. Born to Russian-Jewish parents in the Lithuanian region of the Russian Empire, Heifetz spent much of his career in the United States and became a U.S. citizen in 1925. “God’s fiddler,” as he was called, was known for his impeccable technique, intense vibrato, and revolutionizing the violin soloist style. There were the violinists who came before Heifetz and there were those who came after. The latter kind more or less modelled themselves after Heifetz’s playing style. There’s little one can do wrong when selecting a piece of music played by Heifetz because the man do little wrong when playing the violin. The current violin solo standard is the trio of Brahms, Beethoven and Mendelssohn concertos. Every aspiring violinist masters these three grand pieces of music and fortunately for us, Heifetz did recordings for all of them. Much of his fame came from numerous albums of the expected classical repertoire as well as Tin Pan Alley genres. However, he unfortunately never recorded Vivaldi’s Four Seasons, another recognizable concerto that showcases a violinist’s mastery. Perhaps Baroque’s rigid rhythms never suited Heifetz’s naturally Romantic timbre. Gustav Mahler wasn’t the most popular composer during his days and was known for his conducting rather than composing. The American conductor Leonard Bernstein revived Mahler’s symphonies in the Fifties and Sixties and recorded marvelous renditions of them, bringing the composer’s music into the spotlight. To speak of Mahler’s symphonies is to imply Bernstein’s performances of them among classical music circles. The two men had many things in common. Both were composers and conductors concurrently, and both were of Jewish ancestry while assimilating into their country of birth. Mahler was born in the region of Bohemia of what was known as the Austro-Hungarian Empire in 1860. He played the awkward and dangerous balancing act of being both Austrian by nationality and Jewish by ancestry. Anti-Semitism plagued Austrian culture especially within the “high-culture” cliques like classical music. Mahler didn’t miss the sinister racism like so many of his other Jewish friends and wasn’t so naive as to be public about being Jewish. He converted to Christianity in 1897 so he could lead the Vienna Hofoper (the state opera for one of the global capitals of classical music) which barred Jews from its most respected position, and married a Catholic wife who was an outspoken anti-Semite. Some music critics argue that Mahler’s music has very apparent Jewish influences although I can’t fully affirm it. These musical “notes” of flavor are mostly relative and subjective in my experience. But what is certain to me is that his adagietto from Symphony No. 5 possesses an indescribable pathos. It’s a melancholic tune at first hearing but has moments of comfort and hope during harmonic phrases as well as brief peaks of anxiety with its striking dissonances. This entrancing imbroglio of moods puts Mahler high on my list of favorites. On my list of musicians here, Daniel Barenboim is undoubtedly the most politically bold and bolder than many other classical musicians. Therefore I contend that Barenboim deserves a special, amusical mention. Born in 1942 in Buenos Aires, Argentina, Daniel Barenboim only spent about ten years in the Argentine capital before he and his family moved to Israel. He was first a star pianist then a star conductor. He’s a beloved musician in Europe, but not without a claim to infamy as well. His statements on the Israel-Palestine conflict attracted much controversy, expectedly for a such a benighted conflict. His musical projects to improve this bitter situation are his most impressive feat. Barenboim mentioned his admiration for the original Israeli Declaration of Independence in that it promised equality and freedom regardless of religious or ethnic background. This “gap between the idea and the realities of Israel” referred to the occupation of Palestinian land which Barenboim saw as an unrealistic goal. The conductor asserted that Palestinian protests were not a product of anti-Semitism but of injustice and expulsion. He once said that he isn’t a political man and one can see that in this conflict, “political” is easily synonymous with the uncompromising. With Hamas’ growing power in recent decades, the prescient maestro, like so many others, sensed a growing odor of “anti-Jewishness”—as opaque as their perpetrators frequently imply it. He reiterated that the Palestinians must never forget the Holocaust and their grievances mustn’t become anti-Semitic. There are important distinctions to be made in this messy squabble, and the worst of the propagandists will continue to blur them by wielding peace on one hand and holding a gun with the other. Barenboim is not a prey to these deceptions. Amid the loud cacophony from both sides of extremes, the orthodox Israelis and the jihadists forces, Barenboim represents what is now unfortunately a rare voice that’s alien to the people in power. He emulates the shrewd rhetoric agreed upon by many intellectuals and policymakers, yet the direction of this conflict has swerved farther away from peace since it began. Barenboim is allegedly the first person to hold both Israeli and Palestinian citizenship. He spends part of his time with the West-Eastern Divan Orchestra (founded by him and Edward Said), a youth orchestra dedicated to encourage dialogue between Jews and Muslims. If there is anything every decent human being should share, it is an appreciation of the arts and music. Those who want to destroy art because of an unwelcomed ideology will want to destroy other forms of expression as well. Barenboim has advocated for breaking the taboo on Wagner’s music in the Israel Philharmonic Orchestra. The “Funeral March” from Götterdämmerung was the last piece of music played by the Berlin Philharmonic Orchestra before they evacuated from Berlin at the end of World War II.